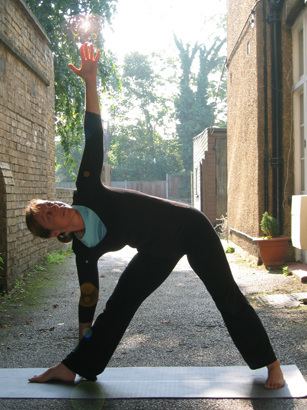 "Elaine is an excellent Yoga teacher with numerous postures and adjustments with props under her belt. She is very sociable and friendly and this encourages us to discuss our problems with her so she can work with us. She really enjoys teaching and her healing energy always radiates in each class having an immediate effect on our practice!" "I have been coming to Elaine for yoga lessons for the past three years. In that time we have become close friends. Elaine’s warmth, kindness and passion for everything she engages in cannot be matched. I now attend classes twice a week and they are the highlight of my week. If I have to miss a class, I feel cheated and off kilter, until I can get back. ​Through yoga, and with Elaine’s dedicated support, I have learnt to enjoy exploring the limits of what my body can do, and pushing those limits. This has spilled over into other aspects of my life, where I find myself better able to focus and to challenge myself. Yoga has improved the quality of my life on every level. I feel blessed to have found Elaine and the special energy she, and yoga, bring to my life. I don't always use props as Elaine encourages us to push ourselves and discover what we can do without always needing help."